Carole created these pretty Christmas cards with Cosmo Cricket's "Mitten Weather" Collection. Creating with purple, red and green was a little different for Carole but that is what made this collection so nice because it all worked so well together and all the cute stickers, borders and tags all matched perfectly for all the embellishing. Iris made a set of Christmas cards that are very easy to re-create - and very economical too. If you take a close look at these four cards, she only used two sheets of patterned paper from Webster's Pages Waiting for Santa (The Delivery and Falalala), plus some dark green cardstock. Add a few stamping using Pink Paislee stamps, ribbon or lace, and some Prima flowers, and you are set to send holiday greetings on the way. Not normally much of a cardmaker, Louise created these in under an hour and loved them so much, she's mass producing them for Christmas! 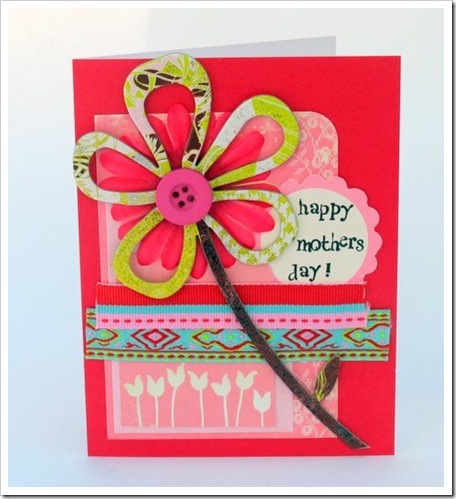 She started with some white cardstock and cut a 1" strip off before embossing it with a dotted pattern. The strip was then given a decorative edge with a border punch and put aside. Next she cut 1" strips from the various printed papers and sewed them together with a zig zag stitch. These were then cut down to fit onto each card size front and the corners were rounded. To add interest to a couple she punched a scalloped circle out of the background and then all backgrounds were adhered to the card using foam tape for dimension. Using the diecut paper, she cut a 1" strip from the edge and positioned it, adhering the punched cardstock strip over the top to hide the edge. Arrange the Poinsettia flowers and vines into place and adhere with a strong glue. 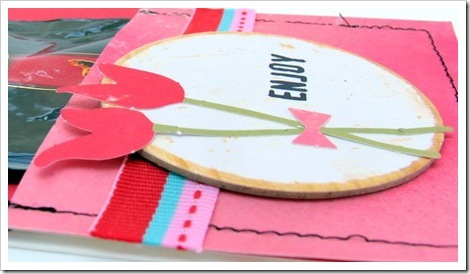 Stamp some words onto offcuts of the same cardstock and use a 1" circle punch to cut out your headings. Arrange and adhere with foam tape into place. These cards are very quick and economical to make, and each can be made slightly differently just by changing your title, punches and the order you sew your papers. There’s no point denying it, we’re definitely on the countdown to Christmas now. So over the course of the next few Mondays, we thought we’d bring you some inspiration in the form of Christmas cards, but not just any Christmas cards – these are useful Christmas cards! They’re the kind that you can make into a practical production line. The kind of versatile design where you can give each one a unique touch, but that still follow a similar layout so that you don’t have to reinvent the wheel for every card you make. Enjoy! Sue Tonga loves to send Christmas cards to her extended family members that are personal and handmade. Sue's family love to see photos of her kids and so she created this cute pocket card which holds a tag with the kids' photo and room for a handwritten message. Sue chose to use the Crate Paper Snow Day collection which contains a lovely set of whimsical chipboard elements which were perfect for embellishing the cards. To create the card, Sue first started with a base of Kraft cardstock that measured 3 3/4 inches x 5 3/4 inches. Sue then cut a piece of Hambly gold overlay and a piece of Snow Day paper to create the pocket. Sue adhered the Snow Day paper to the bottom of the overlay with double-sided tape and then sewed the combined piece to the Kraft cardstock, leaving the top open to allow for the tag to slide in an out. Sue then adhered the Kraft cardstock to a piece of vanilla cardstock measuring 4 x 6 inches. To create the tag, Sue cut another piece of Kraft measuring 3 1/4 inches x 5 inches. Sue cut a different pattern of Snow Day paper, sewed around it in gold thread and added a 3 inch square photo to the centre. Sue then stuck it towards the top of the tag and added some ribbon and a fabric brad to finish it off. Sue says you can easily make more than 12 cards using the Crate Paper Snow Day chipboard set due to the simple card design. It is fun to be able to create lots of cards that are all similar but are unique too. And don't forget, if you don't have children and would still like to do something like this for your Christmas cards, you can always include photos of your favourite Christmas ornaments instead. These BasicGrey Jovial cards are super effective and great to make on a production line when you’re creating a large volume of cards in preparation for Christmas. To make them, Kathie’s used the Jovial 6x6 paper pad and a set each of Woolies, Pops and Die Cut Shapes. She estimates that you can make around ten cards with one set of products, with loads of paper left for other projects. Making the cards is easy. Kathie simply cut her favourite sheets from the paper pad to 6x4inches and adhered them to blank cards cut from Vanilla cardstock. She then trimmed the offcut patterned papers with decorative scissors to create a pile of border strips. She overlayed two or three strips over each background sheet, then adhered one of the DieCut shapes over the strips with 3D tape. A Wooly or a Pop perches on top of each shape. To finish, Kathie printed up some Christmas sentiments on the leftover cardstock and adhered one to each card. Caz whipped up these quick and easy Christmas Cards using the new Everybody Loves Christmas rang from Echo Park. Caz cut out the 8 larger journaling blocks from the Journaling Cards sheet of paper. She then chose co-ordinating patterned paper for each one and covered the front of the white cards. 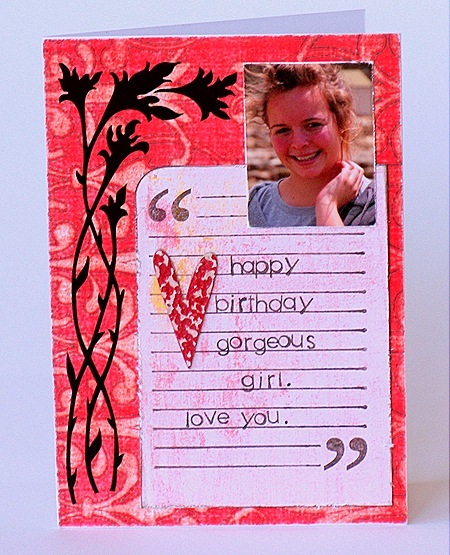 The journaling blocks were mounted on double sided foam tape and attached to the lower half of the card. 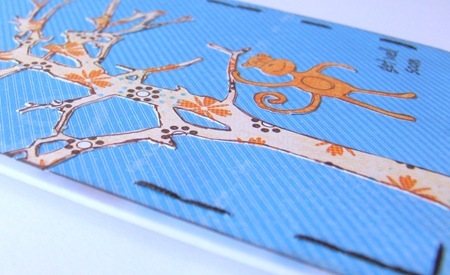 2 thin strips of contrast patterned paper were added to the top and bottom of the cards and a sticker where needed. Caz then used the smaller journaling blocks and some other strips of patterned paper to decorate envelopes to match the cards. For this series of cards, Mel has used one of the Hero Arts card packs that we stock at Aussie Scrap Source. They are available in a variety of colours with each pack containing 10 acid free cards with matching envelopes perfect for those different special occasions. The cards are coloured on the outside and crisp white inside, just right to hand record your message. 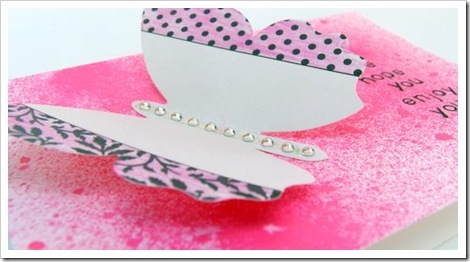 The new range of Glimmer Mist sprays are perfect for cards. Lightly spray a colour over the entire front of your card (as Mel has demonstrated here using Pink Bubblegum) to create a beautiful working surface. 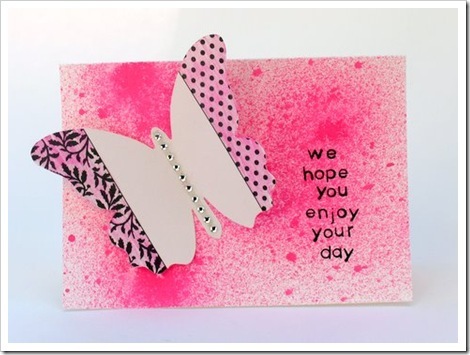 Add a Jenni Bowlin die cut journaling card (butterfly), some Heidi Swapp bling and colour in the edges of the butterfly to match the Glimmer Mist. Add a special message to Mum using Hero Arts Basic Lowercase Letters. 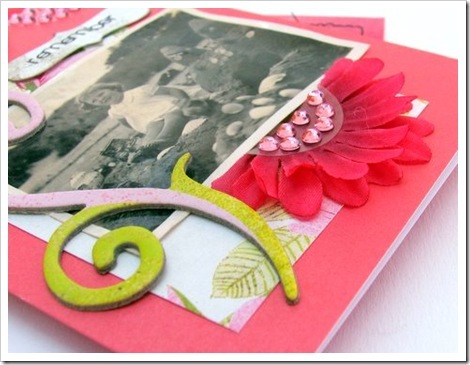 Create an attractive card with a little layering. 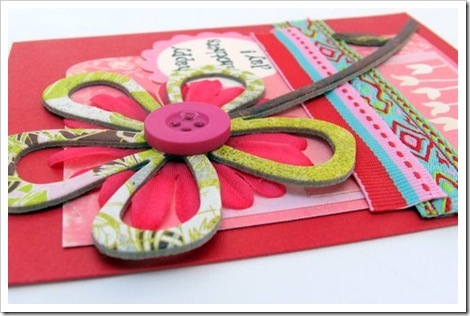 Here Mel has used a Heidi Swapp flower as her base, adding a Basic Grey Sultry chipboard flower and a Basic Grey button on top to complete the dimensional feel of the card. 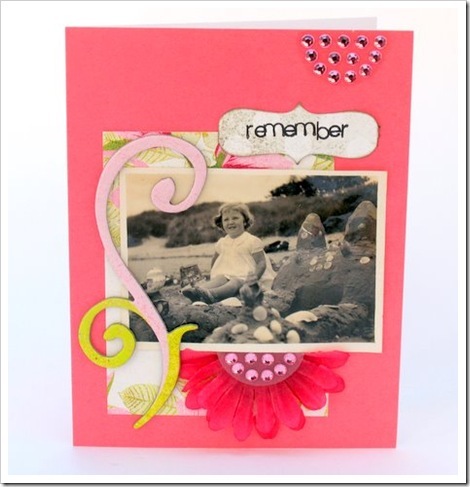 Add an older photo of your Mum to her card this year for something really special. Fold a smaller sized Heidi Swapp flower in half directly underneath the photo, adhere into position and add some bling for a soft, pretty feel. 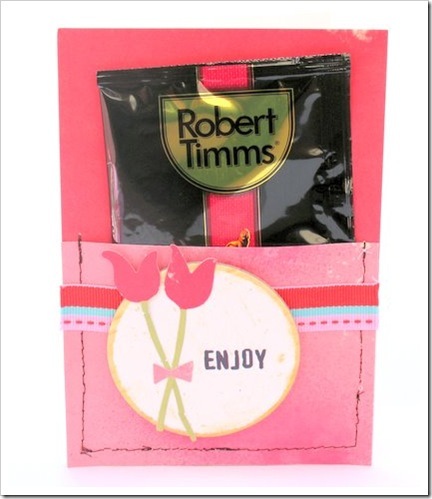 Pamper your Mum and create a cute little pocket on her card to hold a tea bag or coffee satchel. Mel has stitched the pocket into place and added a splash of glimmer mist (Pink Bubblegum) and BasicGrey ribbon before attaching her main message to the card - enjoy! another selection of cards from the lovely melissa goodsell ... she has some great new ideas for fast but lovely handmade cards. Mel has used her all time favourite journaling stamp (Quotes background) combined with some Basic Lowercase letters to put together a card with a personalised message for a friend. 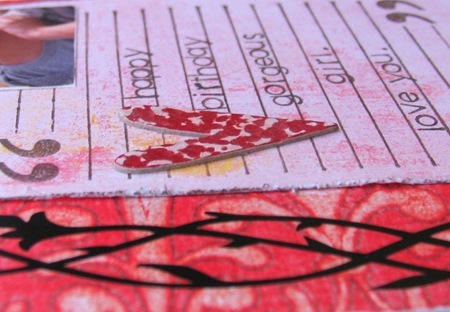 To add a finishing touch the Tim Holtz texture hammer was used on the Heidi Swapp chipboard heart to achieve a dimpled appearance and then lightly sanded to give a nice mix of white and red. An easy way to use up those left over embellishments is to cut out a small series of 3cm squares, ink the edges and combine a mix of accents with some hand stamped messages. 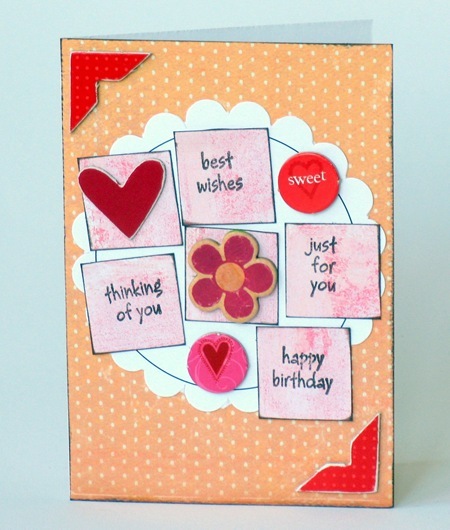 Mel has the 'small greetings' boxed set again to create this fun and funky birthday card. 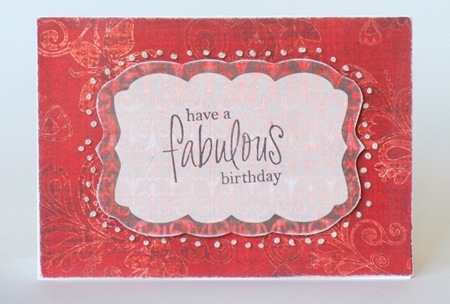 The Sassafras Lass die cut trims are perfect for stamping that special message on and adhering as a main feature of your card. 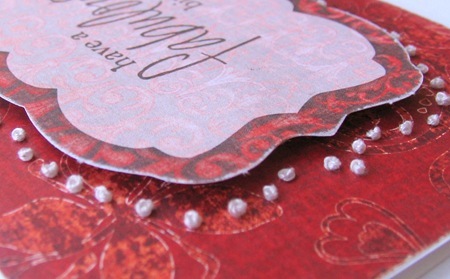 Mel has used pop dots behind the die cut trim to add dimension to the card and added a selection of small French knots around the outer edge. The stamp used here is 'Fabulous Birthday'. The 'Playful Animals' set contains a sweet bear, elephant, monkey and lion stamp, fantastic for scrap booking projects or birthday cards. 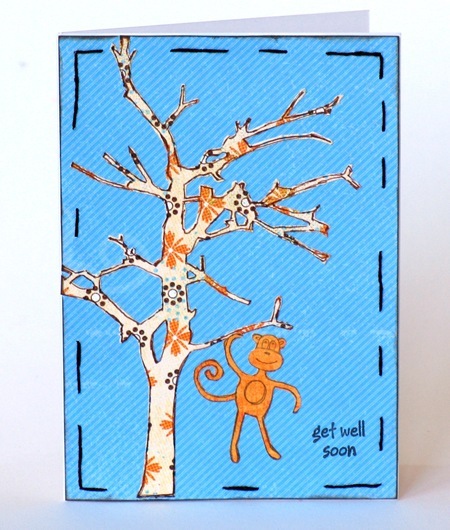 For this get well card Mel has stamped the monkey directly onto a plain piece of paper, hand cut out the design and swung the monkey from a Basic Grey diet cut tree (Mellow die shapes). The get well stamp is from the 'small greetings' boxed set.